The cost is prohibitive currently, because for just the fabric for three windows, we would be looking at spending $700-$800. So I’ve had my eye out for some less expensive alternatives that we could be happy with for the time being. I was at Tuesday Morning and came across these light-weight teal panels that have a faux linen look, but are just cotton. 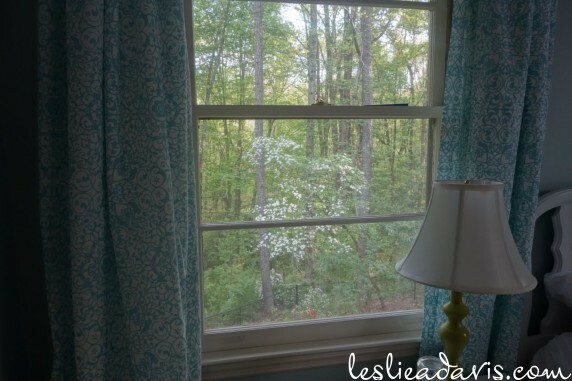 I’m not a huge fan of grommet-top panels and the fabric is quite thin and not lined, but they are extra-wide at 54″ and long at 96″ and I have the lined roman shades for blocking light. 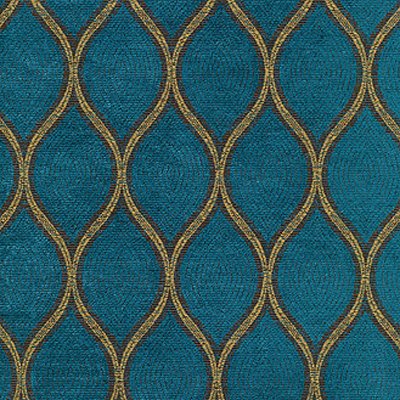 They are not the same color/shade as my accent fabrics, but complementary, which I like so that it isn’t so matchy-matchy. Bradley likes them a lot and had mentioned a few times lately that he would really like to have curtains to make the room feel more finished. 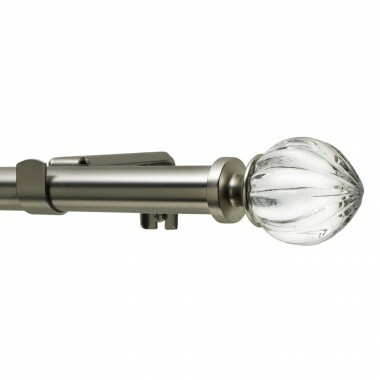 The total cost with these curtain rods from Amazon came in at around $155, so I can’t complain about that. 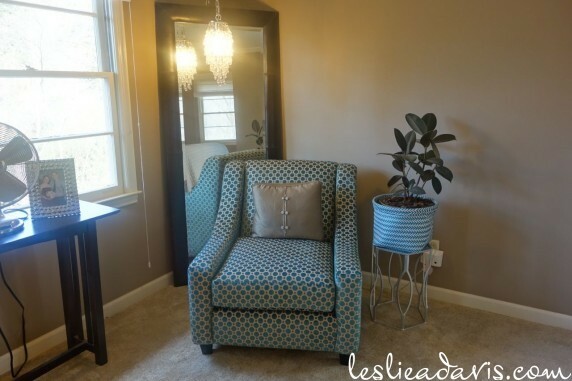 This entry was posted in Bedroom, Our Forever Home on June 8, 2015 by Leslie. 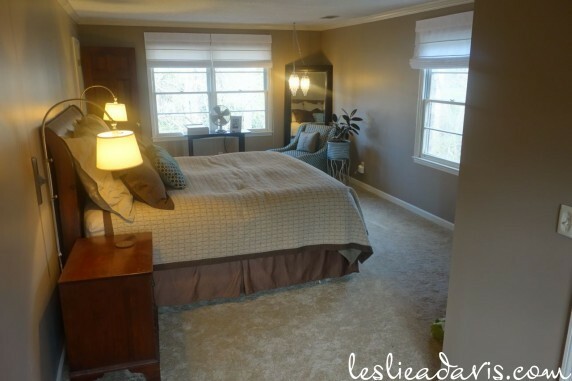 The third bedroom upstairs is a completely spare room at this point. It is on the front side of the house, so it has a double window that provides nice natural light. Since the move, this has been our cat’s room, but I did decide to get my old twin size bed from my parents’ house to set up in here as well. I’ve wanted to use navy in our house for a while now, and this spare room already had navy curtain panels from Pottery Barn Kids that were left by the previous owners. It was the perfect opportunity to try it out. 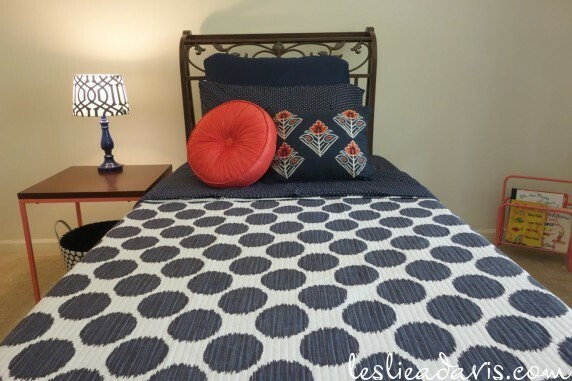 I found the quilt, sheets and accent pillows at Steinmart – which gave me an accent color to go with the navy – coral. 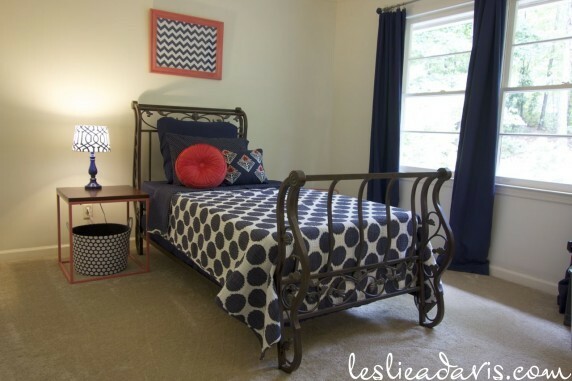 I searched for inspiration pictures of rooms using navy in order to find a complimentary wall color. Over and over my favorite pictures were of rooms in which the walls are a shade of white and the navy accents make a statement. I decided to go for it and see how I liked it in my house – I’ve never not used color on the walls before. I didn’t want the trim to look dingy or yellowed, so I had Sherwin Williams color-match the trim color which is Cottage White by Behr. 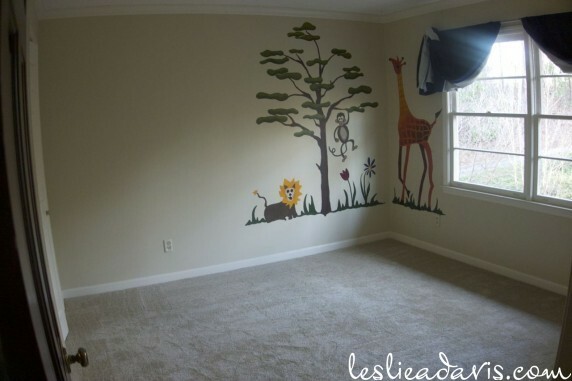 I sanded the jungle mural and put two coats of primer over it, then put two coats of the wall color up. 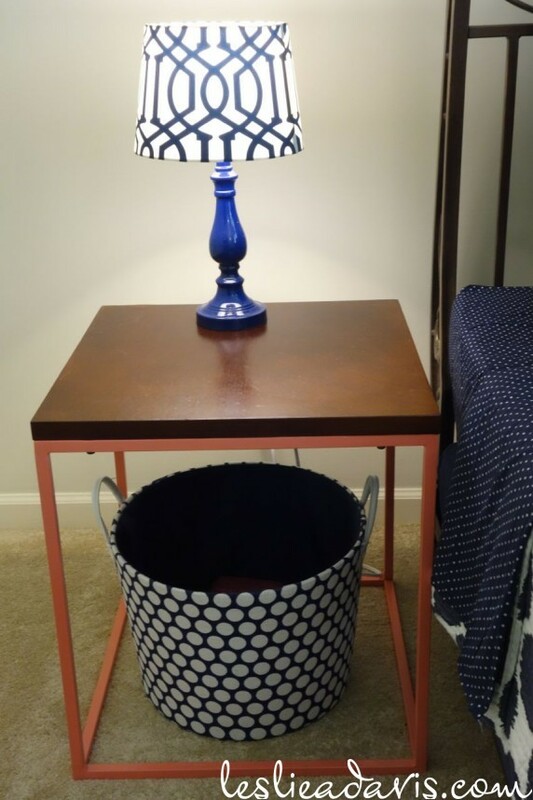 I painted the metal legs of a spare side table using Krylon’s Coral Isle. I also used it to paint a frame I got from Goodwill – the navy chevron print in the frame is just wrapping paper I had already. The lamp base, which was in the guest bedroom at the old house, is painted Rustoleum’s Deep Blue now and paired with a lamp shade from Target. I found the polka dotted bin that sits under the table at Home Goods. I’m stashing the few kids toys we keep for visitors inside. On the other side of the bed, I painted a thrifted brass magazine holder coral and am keeping kids books from my childhood there. I don’t have a desire to spend any more money on what is truly a spare room at this point, so it is a little sparse in here. 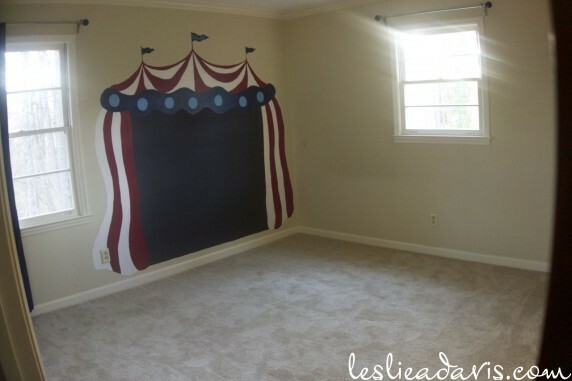 Eventually in this room, just as in the other two upstairs bedrooms, I would like remove the popcorn texture from the ceiling and add a ceiling fan. Also, at some point the closet doors in this room were changed out for hollow core versions. I would like to bring back the solid wood folding doors to match the other doors in the house. 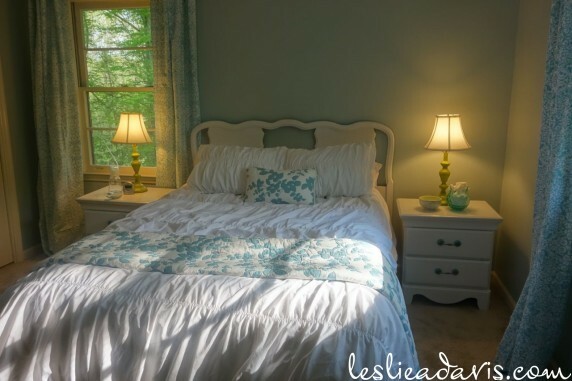 This entry was posted in Bedroom, Our Forever Home on August 4, 2014 by Leslie. In preparation for our first overnight guests at the end of the month, I am finally getting around to painting the guest bedroom. 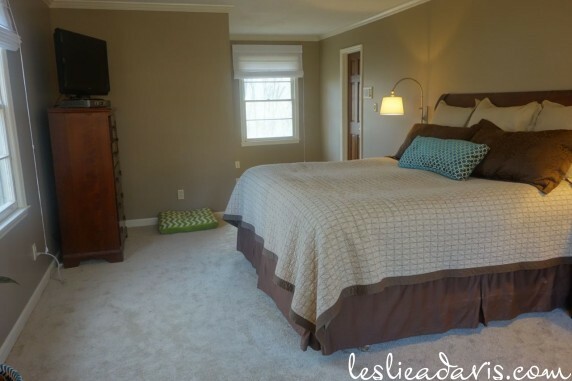 I chose this room as the guest room because it is on the back side of the house and is across the hall from the spare bathroom. 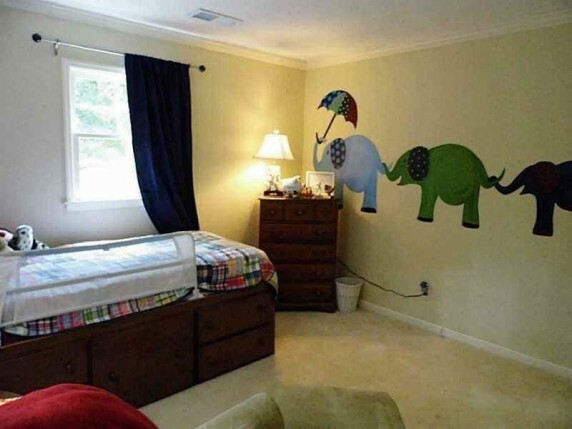 The room had a circus tent mural on one wall and four elephants painted on the opposite wall. I started by sanding them down, then applied two coats of primer. I liked the paint color the previous owners had used in the main floor bedroom, so I found the old paint can in the basement and had it color-matched at Sherwin Williams. The inspiration color is Roaring Mountain by Ralph Lauren. This room is bigger than either of the spare rooms at our first house and it has two windows, which provide nice natural light. I had one of these curtain panels at the old house and luckily Target was still carrying them by the time we moved and I was able to order a few more. It turns out that they are a little long in this room because of the large crown moulding. Even though I hung the curtain rod brackets flush to the bottom of the crown, the curtains still puddle a little. This room is on the back side of the house, so anyone staying with us will have this nice private view from the window. Not a neighbor in site. 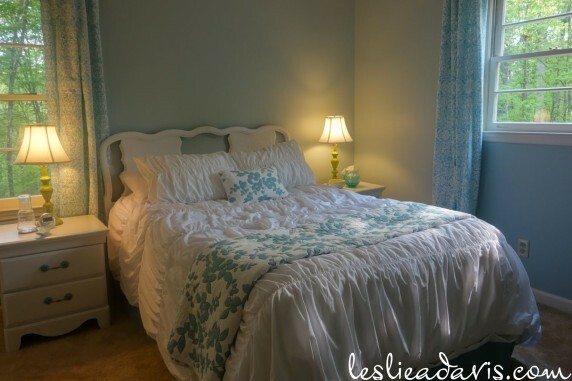 This entry was posted in Bedroom, Our Forever Home on April 25, 2014 by Leslie. Our bedroom in this house is quite large. It spans from the front of the house to the back, and includes windows on three sides. 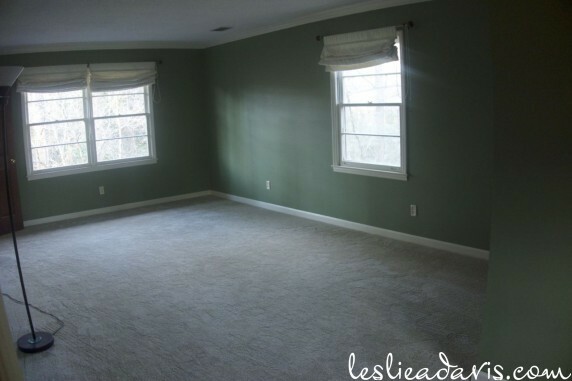 This was the other room I made sure to paint before we got the furniture moved in. I really liked the color I ended up with in our old bedroom – which was a product of adding several paints together, therefore I couldn’t just buy more. 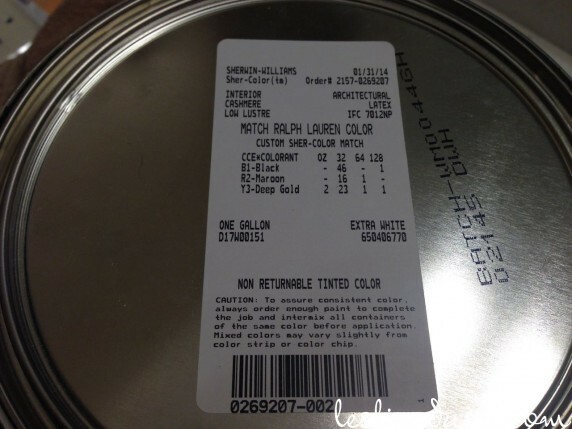 I took our old paint can to Sherwin Williams and had them match the color in their Cashmere line for me. 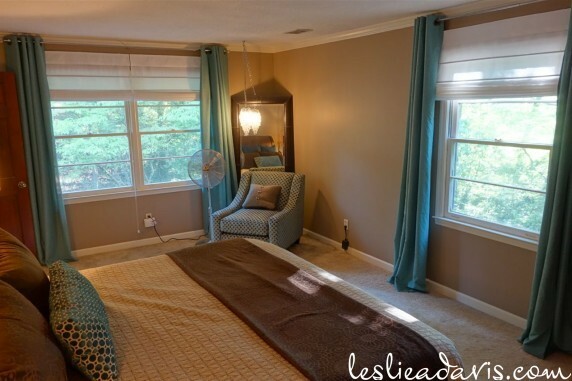 I removed the fabric window shades left by the previous owners – they were a little frumpy for my taste. 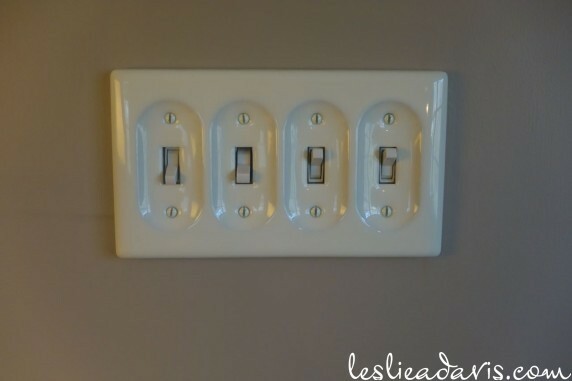 I decided to keep the slightly odd-looking switch plate covers once I realized they were old porcelain covers, which I think adds a lot of character. (If they had been plastic, I would have traded them out for flat covers.) We decided to place the bed on the same wall as the door because the other direction it would cover half of the window, and because the switched outlets are on that wall. The windows in this house are original wooden windows, which I love, but it means there is no room left for inside-mounted window coverings. I ordered more tailored looking white Roman shades from JC Penney as the first layer of window treatments. The curtains will have to wait until I have several hundred dollars to spend on fabric. 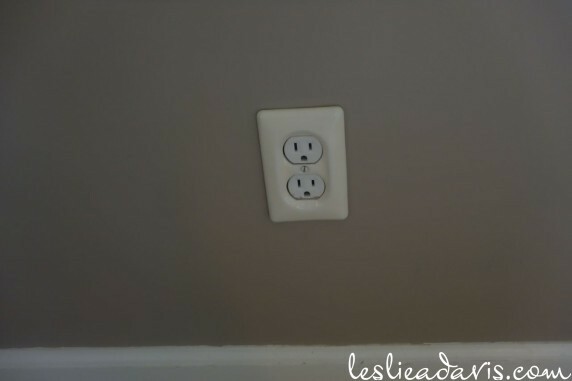 Remove the popcorn texture from the ceilings upstairs, to match the downstairs ceilings. 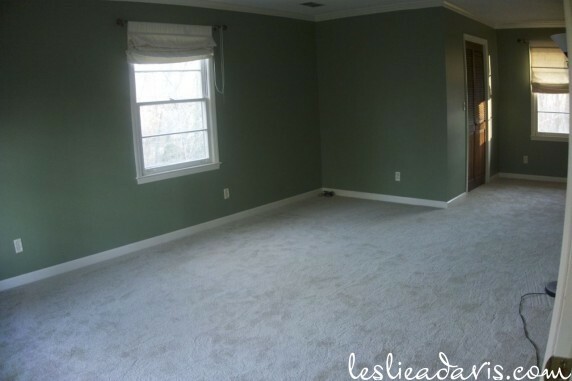 Remove the carpet upstairs and put down a hardwood flooring. 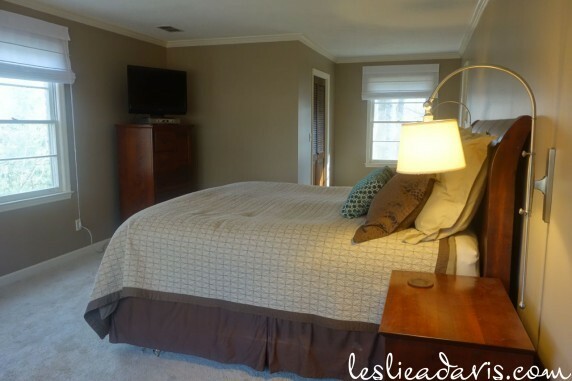 Add a ceiling fan to the upstairs bedrooms. Transition all door hardware to oil-rubbed bronze to blend into the stained wood doors. And of course, save up for curtain panels made from this fabric. 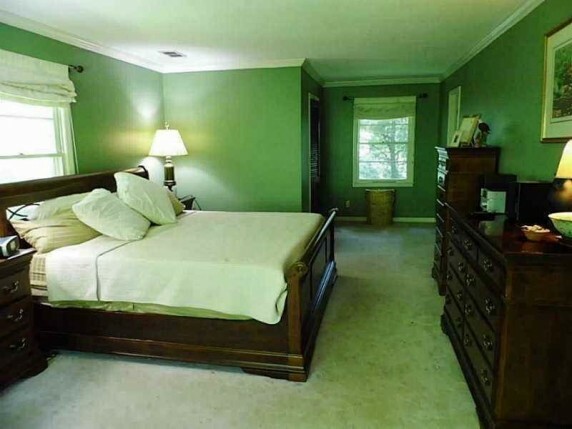 Here is how the previous owners had the room staged and painted. The color was very green. 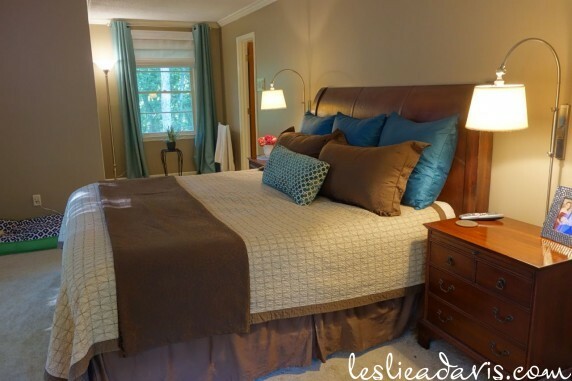 This entry was posted in Bedroom, Our Forever Home on February 27, 2014 by Leslie.